(begins at 1 hr mark). "21st CENTURY BLUES WITH DOWNTOWN DEB"
"THE CURE FOR THE BLUES"
More Radio shows coming soon! INAUGURAL IBMD CELEBRATED BY THOUSANDS WORLDWIDE. Facebook petition reaches 14,500 members! The FB petition group (to declare an international Blues Music Day) continues to reach new blues fans and supporters around the world. FULL interactive IBMD WEBSITE is ONLINE! IBMD t-shirt line launched, featuring 7 designer prints -- to help promote the IBMD cause around the world on the street level. We hope the success of our new t-shirt line will also help establish an initial seed money fund required for the start up of our non profit organization, legal filings, press kit and media kit mailings to hundreds of blues societies, music presenters and press outlets worldwide. That should position us well for recruiting real sponsorship & grants to properly fund the establishment & promotion of the first ever International Blues Music Day. We hope to present at least 3 large scale events in Three countries TBA and also help support & promote hundreds of additional events worldwide on IBMD. Support the cause, Get the t-shirt, Spread the word! Check out the full IBMD t-shirt line here. Target date set to celebrate inaugural IBMD! A target date for the IBMD inauguration has been set for August 3rd of 2013. 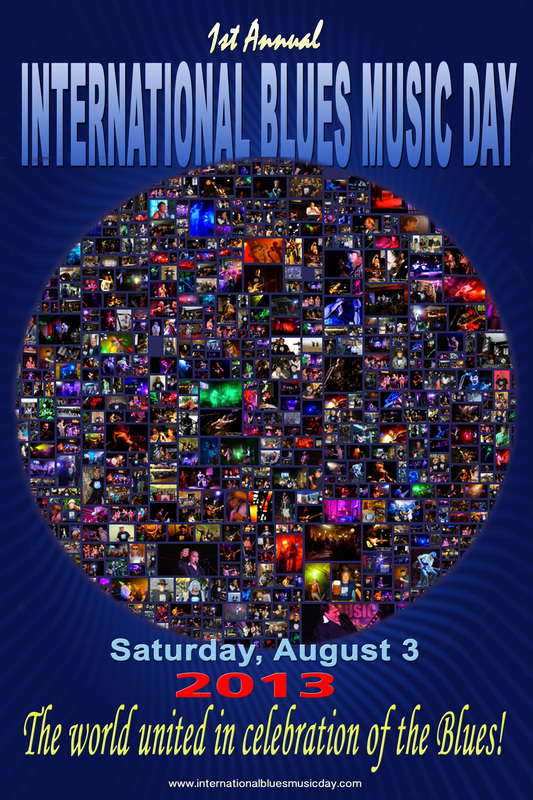 After consulting the fb petition group with over 12,000 members as well as top music industry officials, Blues music organizations, educators and various international institutions, we have arrived at a consensus to establish an annual International Blues Music day during the first weekend in August beginning in 2013. The formula for the annual advertised date will be the first Saturday in August beginning with the inaugural IBMD events on August 3, 2013..
Facebook petition reaches 10,000 members! First major goal of getting ten thousand people from around the world, to join the FB petition group has been reached! Plans are under way to finalize an official date for International Blues Music Day.